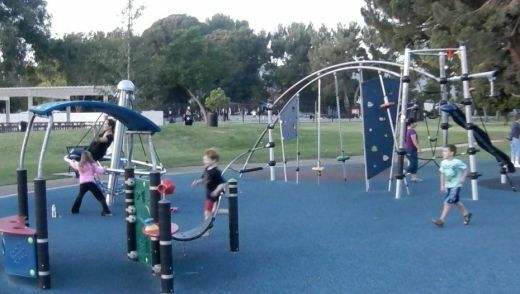 Bob Kildee Community Park is located at 1030 Temple Avenue (at Ponderosa) in Camarillo. This 13 acre parkhas newer play equipment and restrooms, 6 lighted tennis courts, handball courts, horseshoe pits, soccer fields, picnic shelters and BBQ pits, 3 lighted baseball features, the Pleasant Valley Skate Park, and Pleasant Valley Aquatic Center. More information at www.pvrpd.org/parks/active/kildee.asp. The park is named after the Pleasant Valley Recreation & Park District's first Chairman of the Board from 1962-1966 and again in 1968. 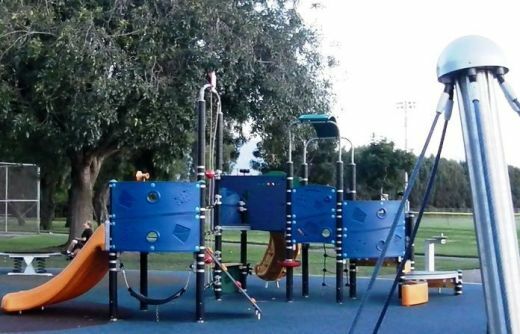 As you can see from the photos below, the play area has some pretty cool and unique equipment!